Home > Blog > Which Mega-Bank Direct Mail Checking Account Offer is the Most Effective? Which Mega-Bank Direct Mail Checking Account Offer is the Most Effective? If you were currently in the market to change banks, would you choose Chase or Wells Fargo for your next checking account? Or perhaps choose a community bank or local credit union? The reason for today’s blog is that something very unusual occurred at the Topper household in Sacramento over the past several days – two self-mailers arrived promoting a cash bonus for opening a new checking account. One offer was from Chase while the other was from Wells Fargo. As faithful blog readers know, I’ve been receiving a Chase self-mailer offering a cash bonus for opening a checking account every few months for the past three or four years. I’ve written several blogs about the Chase offer and the self-mailer format. What’s very unusual is the Wells Fargo checking self-mailer, which arrived the other day, is the first such mailer promoting checking in a very long time…at least for the Topper household. The arrival of both self-mailers within a few days of each other presented the perfect opportunity to compare two mega-banks’ cash bonus offers, the type of checking account being promoted, and the self-mailer format being used. Here’s the front of both self-mailers. 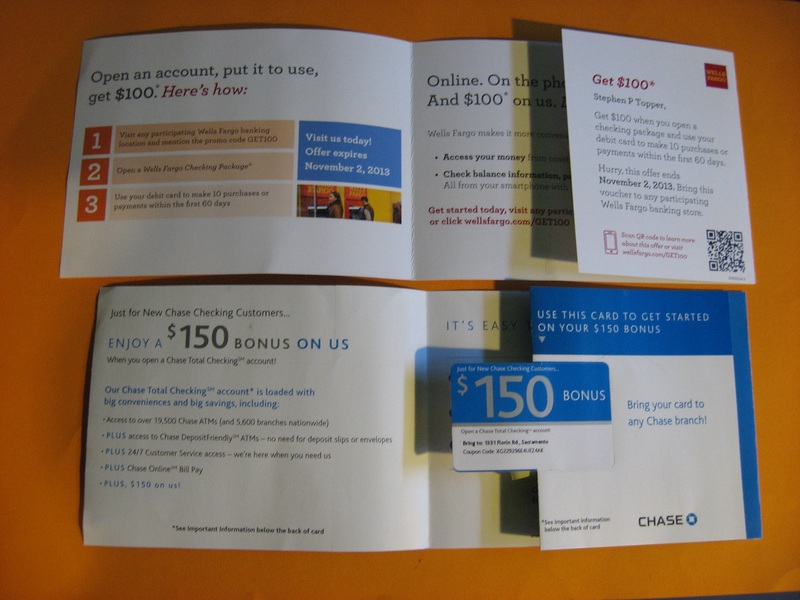 While the familiar blue Chase self-mailer is readily identified as coming from Chase given the logo in the upper-right corner, you have to hunt for the sender of the second self-mailer. Carefully check the upper-right corner. Aha, there it is on the ATM fascia and the mobile phone screen. Here’s the back, personalization side of both self-mailers. 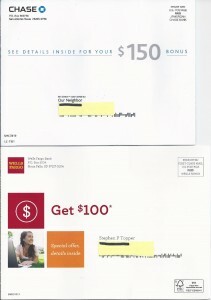 Both banks are readily identified on the back of the self-mailers in the corner card (upper-left corner) and the preprinted indicia (upper-right corner). 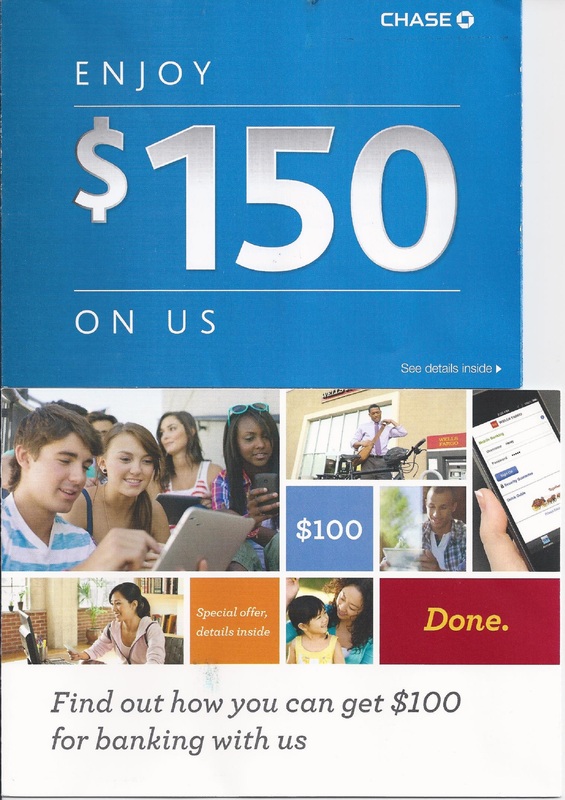 Before opening either self-mailer it is obvious that Chase’s $150 cash bonus offer is superior to the $100 cash bonus offer from Wells Fargo. Before moving on I must point out that while these are known as “cash bonus offers” the consumers opening a new checking account do not walk out of the branch with cash in hand. The money is deposited into the new checking account after certain conditions are met. Now take a closer look at the address block on both self-mailers. Notice the significant difference? Chase replaces the prospect’s name with “Our Neighbor” which provides a wider audience that includes recent movers to the address in question. When you take the Wells approach of addressing the self-mailer to Stephen P. Topper, you are basically eliminating anyone other than Stephen Topper from responding. Moving on, below are both self-mailers in the partially-opened position. The Chase mailer is more visually stimulating with its die-cut bonus card protruding from its panel. A removable card provides prospects with tangible proof that they are entitled to the $150 bonus during their branch visit to open a new checking account. In addition, it’s an excellent place to list the nearest branch so the prospective customer doesn’t have to search for it and write it on a piece of paper. Direct mail test after direct mail test proved that interactive devices boost response. 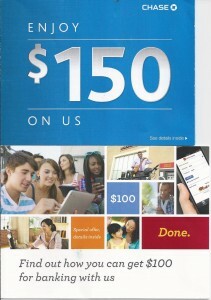 While they add cost to the direct mail piece, the additional response makes it a worthy investment. Note the absence of both a removable bonus card and the nearest branch address in the Wells Fargo mailer. Of course, a case can be made that most consumers receiving either mailer pretty much know the location of the banks in their area. Yet, tests have shown that providing the address – and even a map – helps response. Finally, reading the copy in both mailers you discover that it’s a bit tougher to qualify for the Wells bonus. With Chase you simply have to open the new checking account and deposit $100 within ten business days and the $150 will be deposited to your new account. With the Wells offer, to receive your bonus you must use your new debit card to make 10 purchases or payments within 60 days of account opening. This means it’ll take a bit longer to receive your $100 Wells bonus. Given a side-by-side comparison of which bank to choose, Chase wins hands down. Frankly, I’m surprised by the Wells Fargo offer given the ubiquity of the Chase offers that have been pouring into California for the past few years. One would think that the Wells marketing team responsible for this mailing would have wanted the Wells offer to equal, or better, the current Chase offer. As it is, there isn’t really a lick of difference between the two banks other than the offers being made, the checking account choice(s) available, and the requirements for receiving the bonus – all simple marketing decisions. On second thought…there is another major difference that’s relevant here. Chase is a consistent user of direct mail for sourcing new checking accounts. Wells Fargo isn’t. This becomes obvious when comparing these two mailers.